Tim Ash is the CEO of SiteTuners, a firm that improves website conversion rates through landing page diagnosis and redesign, conversion consulting, A/B split and multivariate test plan creation, and client training/ mentoring. Tim has worked with hundreds of clients including Canon, Google, Expedia, CBS, Sony Music, Facebook, Cisco, and Coach. He is a highly regarded keynote and conference presenter, and the chairperson of Conversion Conference. 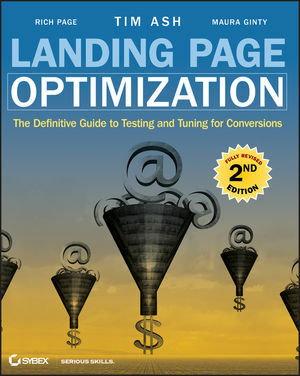 Rich Page is an Optimization Consultant and Web Analytics Manager for a Fortune 500 company. Maura Ginty is a digital-era word geek with deep expertise in search, content strategy, and social media programs at Fortune 500 companies as well as small businesses. All three authors are frequent speakers at online marketing conferences.